Calumet County, WI is located between Appleton and Fond Du Lac in the eastern part of the state along Lake Winnebago just west of Lake Michigan. 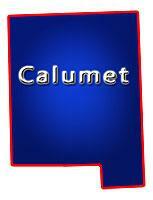 Calumet is more of loaded with public land, caves, hills, steep cliffs, prairies and Brillion State Wildlife Area, Killsnake State Wildlife Area, Kiel Marsh State Wildlife Area and a couple communities including; Forest Junction, Harrison, Brillion, Chilton, Brothertown and New Holstein. It's surrounded by 6 other Counties; Outagamie, Brown, Manitowoc, Sheboygan, Fond Du Lac and Winnebago. On this page you will find Lakefront Properties, Riverfront, Private Ponds, Creek Frontage, Stream Frontage, Waterfront Cottages, Waterfront Lots and more located in this county listed by real estate agents. Calumet County, Wisconsin GIS MAP Information!